The following obituary appeared in the Sei-I-Kwai Medical Journal, issue dated the 30th November, 1901. We regret to have to report the death of Dr. Stuart Eldridge, the Vice-President of the Sei-I-Kwai which took place on November 16th at his residence on the Bluff, Yokohama. Dr. Eldridge, though a man of excellent physique, nearly twenty years ago had a severe attack of acute stomach trouble, from which, however, he completely recovered. Recently he had suffered greatly from a heart affection. Last summer at Kobe on his way to Shanghai from Yokohama he was struck down by the illness which had so long threatened him. A slight recovery, however, permitted his removal to Hayama, but after a stay of some weels there, he was brought home to take his death bed in his residence, Bluff, Yokohama, where he has passed away. The deceased gentleman, a native of Philadelphia, Penn., U.S.A. was born on Jan. 2nd I843. He Entered U. S. Army in his age of seventeen. From 1864 till i866, he acted on General Thomas' staff as Adjutant-General. He was then ordered to Washington and appointed to the staff of General 0. 0. Howard. He served also for a short time with General Grant, who was a warm personal friend, and on General Grant's visit to Japan they renewed their old-time relations, the two spending one whole afternoon in talking over campaigning times. Dr. Eldridge was the first librarian of the Agricultural Department of the U. S. Government and did a vast amount of work in getting it into shape. During his residence in Washington and while on General Howard's staff, the young officer took the study of medicine and obtained his degree of M.D. from the old Georgetown faculty. 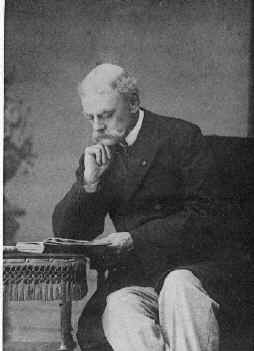 He was immediately appointed Assistant Demonstrator of Anatomy in his college which position lie occupied till he resigned both it and the librarianship of the Agricultural Department to come to Japan as secretary to the scientific mission to Japan under General Horace Capron, who had been specially engaged by the Japanese Government. The party arrived at Yokohama on Aug. 23rd, 1871. His connection with the Agricultural branch was soon severed; however, he was appointed by the Japanese Authorities Surgeon-General of the Kaitakushi, being stationed at Hakodate. There he established a medical school and educated many Japanese medical students aid treated patients in an attached hospital. At that time he published a medical magazine Kinsei-I-Setsu (Modern Medical Science), which was distributed among the medical men in Hokkaido and served greatly for advancing the medical knowledge in northern part of Japan. In 1875, at the expiration of his term, he came to Yokohama and entered upon the practice of his profession. Since then a period of 27 years he continued in active work. Dr. Eldridge was for some time Sanitary adviser to Kanagawa prefecture, Surgeon to Juzen-I-In, and Director of the General Hospital in Yokohama. lie was appointed by the Japanese Government a Member of the Central Sanitary Board, 1883; and latterly he also acted as United States Sanitary Inspector (being appointed Assistant Acting Surgeon on the U. S. M. H. S. 1896, at Yokohama). Dr. Eldridge was elected as VicePresident of the Sei-I-Kwai, October 27th, last year. Dr. Eldridge was a fine presence and an authority on various medical and sanitary matters which when communicated to the public were always welcomed. 1-1 c was a reputed writer and contributor on some medical magazines home and abroad. We can mention here some of his own works such as Kinsei-I-Setsu (Modern Medical Science), on Beri-beri (Kak'ke of Japan), The Arrow-Poison of the Ainos, Echinococci in the Female Bladder, Occurrence of Internal Aneurism in European Residents in Japan, the Ubiquitous Microbe, Brief Notes on the Pest, etc. Japan has recognized his merits on the services to the cause of medicine and to sanitary matters generally in Japan, so H. M. the Emperor of Japan has presented him the Fourth Order of Merit, April 30th, 1897, aid the Third Order of merit a short time before his death. The Sei-l-Kwai has lost one of the most respected Vice-Presidents and Japan has lost a friend in death of Dr. Eldridge. Not only, the members of the Society but also all his acquaintances in Japan deeply mourn of his death. With his widow and his children the deepest sympathy will be felt. Dr. Eldridge was a recommender of cremation, so the process of cremation in accordance with his last wishes has been performed for the remains. The funeral took place on the after noon of November 18th. Indeed the floral tributes were so plentiful that space could hardly be found for them. A very large assemblage of foreign residents and Japanese was present during the service and the chief officials of the Prefecture also attended. The ceremony which was most solemn and impressive, being brought to a close, the urn containing his ashes was conveyed to the last resting place, Yokohama Cemetery. Mr. F. M. Tegner, son-in-law of the deceased, walked behind as chief mourner. The decorations worn by Dr. Eldridge during his lifetime were carried on cushion by Dr. Rokkaku, an old and attached colleague of the deceased Gentleman. As a memoir we reproduced Dr. Eldridge's likeness with the obituary in the English part of this journal.